An early pioneer in graphics chips, Nvidia now finds its processors at the heart of smartphones, tablets and, soon, PCs. Overseeing the expansion is the company’s dynamic leader Jen-Hsun Huang, who sees his chips going ever faster and in more places. Next up for the company is a quad-core chip code named Kal-El. Welcome to the last session of AsiaD. Here’s Jen-Hsun Huang. Walt: Al Gore talked for a long time. Anyway: You pivoted into processors for “post-PC devices.” How many devices are your chips in now? Huang: We’re in about 70 percent of non-iPad tablets. Thirteen models of phones (?) around the world. Walt: Who are your competitiors? Huang: Qualcomm is a direct competitor. We started out as a graphics company, and evolved from serving gamers, designers, etc. And we tried to grow initially by growing into the basic PC market by integrating chipsets. That didn’t work out for me, because “going toe-to-toe with Intel is not a good idea.” So now we’re trying increase the usefulness of GPUs in different products. 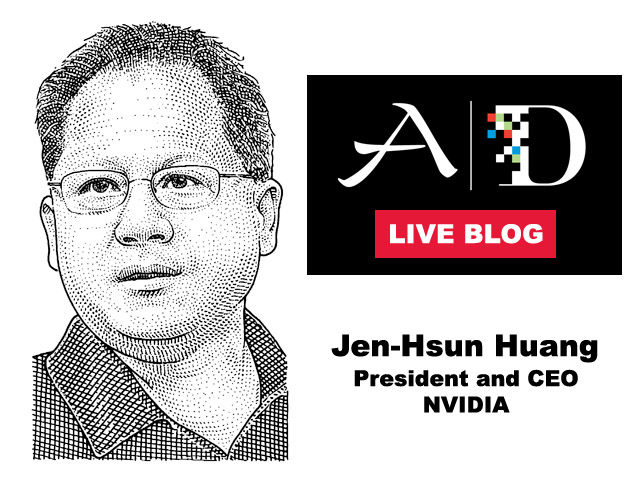 12:13 pm: Walt: Now the GPU for many PCs is more powerful and complicated than CPU, right? Huang: Yep. And they can do lots of stuff now: Computer graphics, image processing. Stuff like what Lytro is doing with their camera. And the second part of the strategy was backing away from the chipset business, and investing in mobile computing. Back to competitors: Qualcomm is direct. Apple is an indirect competitor. We partner with device makers, so in a lot of ways I’ve adopted their competition. 12:16 pm: Walt: So what’s new? Huang: When we first got into mobile, I started talking to the cellphone companies and telling them mobile devices would become a computer. And the iPhone proved that and woke people up. So our perspective is that these devices would be “rich computers — quite powerful computers” and that graphics would play an important role. So we built the world’s first dual-core graphics processor, the Tegra 2, and that’s what we’re shipping today. And now we’re working on our first quad-core processor, Tegra 3, which is really going to be called Kal-El. Huang notes that Kal-El is Superman’s name, and that the rest of the product lineup is also based on comics: “Wayne” for Batman, etc. Anyway: Getting performance is the easy part. The challenging part is delivering that performance with low power, and better and better efficiency. The low-power core with Kal-El is 20x “less hungry” for energy. Second invention: Use the image-processing technique to look at the color content of an image. That allows us to save a ton of power that way. It allows us to sort of “cheat” on colors and use similar colors, with different lighting — the human eye can’t tell. 12:24 pm: Walt: Aren’t your competitors doing quad-cores as well, and trying to reduce power, too? Walt: Is it a disadvantage for Apple to design its own chips? Huang: Apple’s Bob Mansfield is really good at chip design. Also, we sell them chips for their PCs. Anyway, there are a lot of good reasons to build your own chips — they can control the vertical stack, and they might have good insights on bringing stuff to market, and not sharing that with third-party competitors is a fine idea. But R&D costs will go up — I’ve already spent $2 billion on Tegra. So it may become more difficult for companies to build for lots of different segments. Huang: We started completely focused on mobile phones. That was Tegra 2. Then we tweaked that for the tablet market. Now we’re clear that ARM is going to be a large ecosystem. It’s possible for us to extend that beyond phones to tablets and clamshells. Most likely Windows on ARM. Q: You talked about building processors for phones or tablets. Do you think tablet-specific processors are really coming? A: There’s not enough volume with 60 million tablets to build tablet-specific chips. But you can imagine building a processor where some versions are perfect for tablets, and other versions are perfect for high-end smartphones. That’s how you can make the economics work. And we’re done. Thanks for joining us in Hong Kong, all.